This is a pretty detailed look at the hardwood industry for making charcoal, and the commercial distillation products. Someone else may find it interesting. Thanks Sean, right in my alley… nice find. 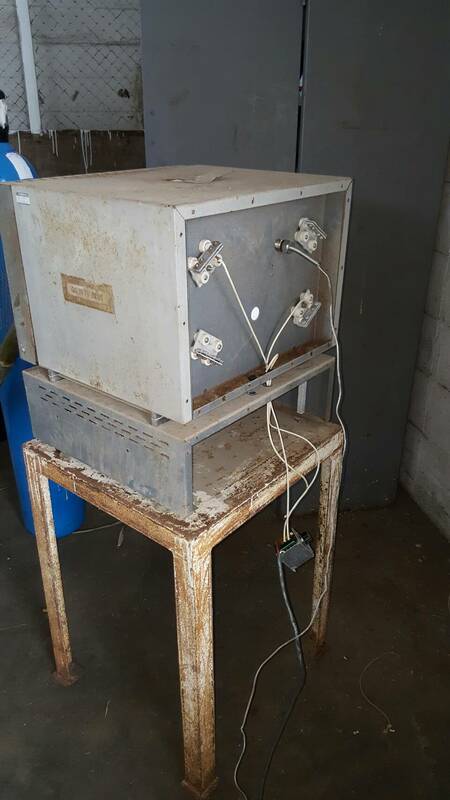 I saw someone with a unit in india that was using a water bath with flowing water… kind of like a water jacket for cooling (which i have also seen) It was a youtube video but I doubt I can find it. The problem you are going to have is the stuff all condenses out between certain temperatures. So you need to make sure, what you are collecting is actually condensing in the right temperature range or else you don’t have what you think you have in your jar. 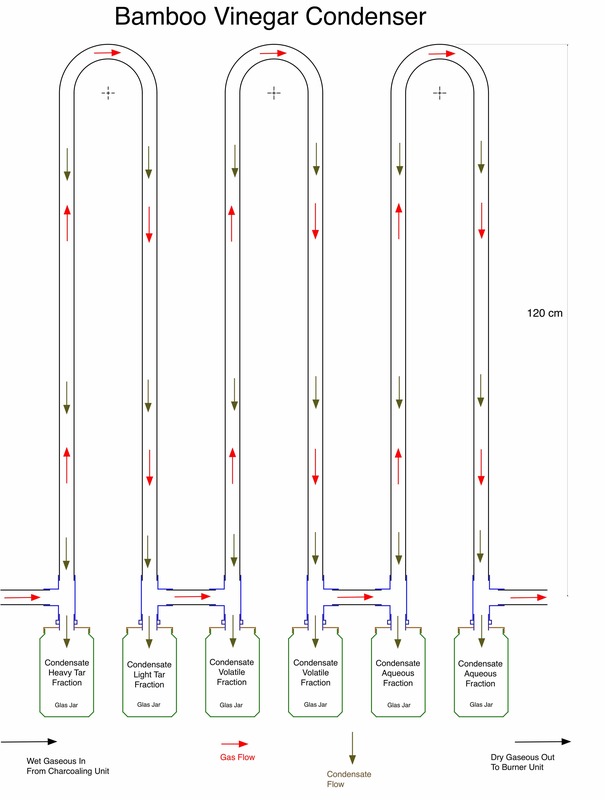 Traditional systems use a super long pipe that are horizontal but rise vertically at a slight angle. This one is the second i build, after the first prototype performed very promising. The first had only 3 collectors and longer pipes. The shorter the pipes the less mixture. A water cooling system would make things a bit more complicated if you want to have things separated so i tried to make some natural cooling effect on different levels. The goal is to use this for farmers, for their benefits. I’m a little perplexed/surprized by all the byproduct, & various distillation processes— I guess I’m realizing that to make charcoal, one also needs to investigate some distillation processes. I expected the acidic vinegar & tar as condensate, but the article points out there could be so many other things distilled from the remaining smoke. I probably will be content if I get fairly clean charcoal production, I might eventually try a water bath bubbler/hay/scrubber based on what the article describes–it seems the industry effort was directed at reducing emissions. After reading the 1957 document, it seems I might be able to capture some serious volatile compounds [in a small home-made way] that need not become airborne. My exhaust pipe will run ‘below ground level’ covered in clay-gravel…the clay-gravel sets-up’ fairly hard & stable, should be fairly easy to tear out for future duct replacement, the ‘path of used tile’ helps me grade the pipe in a drain downhill way, being lower on the left by about 4" than the right. The galvanized duct pipe is 6" round, it is flimsey even when firmly set in clay-gravel, your can see some tiles atop the duct pipe, that will prevent duct pipe cave-in from stepping upon it, I worked the clay-gravel wet or damp, very similar to working with concrete–only easily replaceable in the future. Various stages of backfilling, & placing tiles atop the duct, in the mud, to protect the duct pipe. Further condensation duct pipe will be used [above ground] to extend the pipe, probably another 20-30 foot more , expecting more condensation and heat dissipation along that run. There again, I may eventually have some sort of scrubber installed at some point in the run. It is a really neat design. If you don’t already, put a thermometer at the top of the loops,. Then you can adjust the temperature by adding insulation or cooling like a wet towel around the pipes (even just tinfoil might work). This should allow you to keep the temp within the fraction you want (like water would be 95-105C). The outside temperature will affect it. I would probably keep the pipes longer just because you can insulate them if it is colder out. Water could be more complicated but it is about either a short loop or keeping an accurate temperature. Honestly, I would be more likely to collect it all into one big batch, then separate it out later using a fraction system, either like what you have or a simple distillation. You have to watch the temp, which can be time consuming but you have to stay close and can’t be out in the field because you have to keep checking it and adjusting things. There are a lot of volatiles, and some of them are actually pretty wicked chemicals, so be careful. the big plus of the tlud is that it burns most of them off. I think you can do it underground. It is an interesting project! Depending on how big your retort is, you may need something a lot bigger then a paint tray. My pathetic system collected about a half gallon and could have collected more as I didn’t have the pipes arranged correctly when I started and it didn’t quite let it finish. I still got a little over a half gallon. It depends on how much water is in the wood. You don’t necessarily need a bubbler as you would be introducing water. You can use a water jacket, or bath ie water on the outside of the pipe. It is for more controlled cooling or faster cooling (shorter pipe). I was using wet towels, which serve the same purpose. Sean, l agree. First condense all the products, then separate water solution from tar, then fractional distilate both. A lot easyer l think. 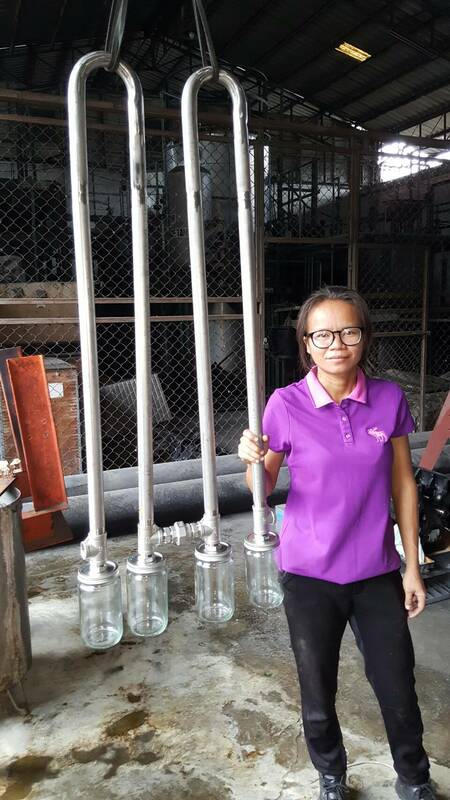 Plus, you can collect lots of condensate and distilate a batch when you have enough time and material. On the other hand, Koens sistem is more efficiant. You heat, cool, heat, cool in the procedure described above, but you only heat and cool once in Koens scheme. That is exactly the difference neither way is wrong. It is just what works best for you. If you can share the eq between farms, it can actually be better. Hi Sean & Kristijan, I wasn’t even entertaining the idea of ‘serious chemical distillations’ but the 1957 paper did cause me to at least consider what is chemically going on. I was just hoping to accumulate a bunch of pitch to paint fence posts with, or waterproof something like a concrete basement wall. But if the tar is so noxious without being further refined,… that it will corrode the concrete or wood…well that wouldn’t be useful it seems. Before I read the paper, I already had this EXH duct excavated & installed, my primary purpose is to safely contain the flames from the furnace, so there is minimal chance of open flames. I just cannot have 20 ft. flames, not even 5 foot flames, my set-up will contain the flames in the EXH duct pipe, similar to a ‘rocket mass heater’. Of course, my experiment is outside, and I’m not using a riser & barrel in the same way that your normal ‘rocket mass heater’ would use…because I intend to produce charcoal, one [55 gal, or 30 gal.]. barrel batch at a time, which a ‘rocket mass heater’ doesn’t normally do. As Kristijan has properly warned me earlier in a different thread, ‘moisture early in the batch is a cooling factor’, so I’m hoping to direct that early in the batch cooking heat thru the EXH duct, including heavy laden moisture/chemical/tar [unburnable] smoke. So I expect the dirt will eventually get hot, as the dirt is highly insulative, and it will take many hours to bake a batch, a good amount of heat is stored in the dirt, even on a snowy day. Once the 55 gal. batch is off gassing burnable fuel, that producer gas from the 55 gal. batch will be directed via a 1" diameter steel pipe & incinerated directly into the burn tunnel & therefore the brick lined furnace, to consume all the producer gas created from the batch barrel. This diagram might give you an idea where I’m attempting to say. 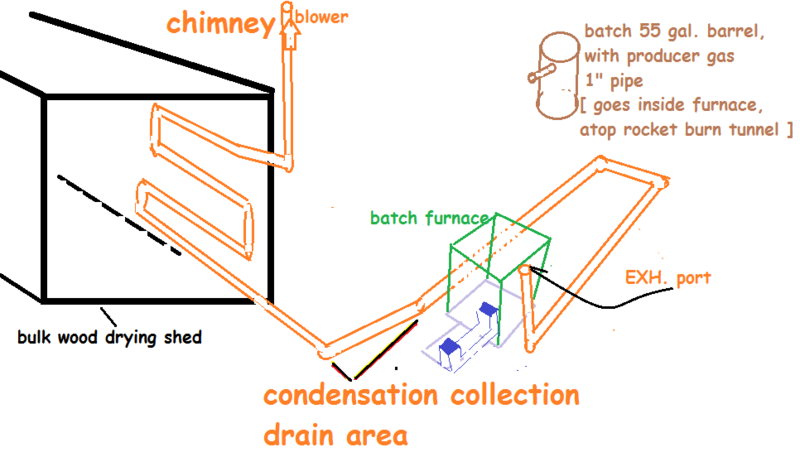 The 1" pipe that vents the batch barrel, the 1" pipe will have two modes of use, the first is to vent wet unburnable smoke directly into the EXH duct pipe, for condensation purpose & heat transfer thru the duct pipe both into the ground, but also radiate heat into the ‘wood drying shed’, as the smoke eventually goes out the chimney, hopefully without obnoxious smell or smoke. The idea here is to dry the wood shed bulk wood with air circulation and radiant heat from the EXH duct pipe, the more moisture I can drive off the bulk wood in the shed, the more efficient my batch process should become! The same 1" pipe [vent] is ‘reconnected’ or changed in it’s secondary mode of which is directed into the burn tunnel, to incinerate the producer gas in the burn tunnel. This change is made after the batch is actually producing burnable fuel. The actual 55 gal. 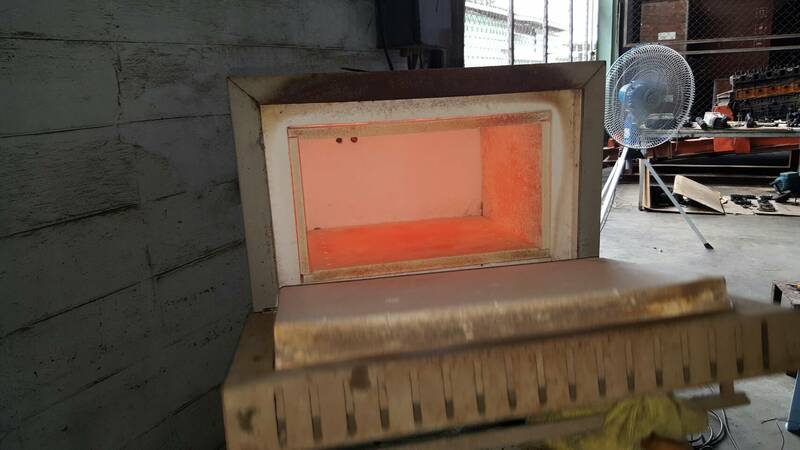 batch barrel/furnace is not moved or opened, the external 1" vent pipe is simply changed from dumping wet smoke directly into the EXH duct pipe, and changed to dump producer gas into the burn tunnel combustion chamber. Now this may seem overly complicated, and it probably is…but thereagain, I simply cannot have open flames in my work area. In my case, with or without cooling, there is no need for further distillation for the purpose, the products can be used immediately. But in case needed, the fractions obtained in the above set, are easy to separate with a minimum of losses. Great thread! Thanks all for sharing insights. Distilling/pyrolysis of tire rubber makes some interesting refinery type products as well. Has been done at various scales of plant and equipment. Can be done with no visible emissions and zero odor. Wow K_vanlooken, such nice supplies, bending heavy pipe into perfect curves is impossible for me. does tar condensation (in this long metal pipe) cause a problem in the long run? How do you keep the hose clean and efficient? The first part of the pipe, connected between the jar’s and the hot oven, needs to be cleaned of the encrusted cake regulary. But that is just about it. I do not recall exactly . There is a piece of land it has it’s own natural gas well . someone built a plant on it for making charcoal . The plant has been in operation for over a hundred years .at some time they also sold a by product and then they stopped . I am saying this to say something about commodities and market .